The Mercurial Vapor V is the first soccer boot to incorporate the Flywire technology, the major enhancement to the fifth model of Nike Mercurial line. The essence of Flywire is to utilize high-strength threads that act like cables on a suspension bridge making a shoe stronger without sacrificing weight. 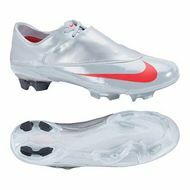 This technology is used fully in the special, pro-model of Mercurial family - Vapor Superfly  where these threads are placed across the entire upper of the boot. But let's see what other changes the Mercurial Vapor V brings us. Teijin - Top Super-Microfiber material; soft, ultra-lightweight, very durable and with capability of adjusting to the foot's shape; lighter and thinner than the Mercurial Vapor IV. Flywire technology - high-strength threads that act like cables on a suspension bridge that reduce the amount of material required for the upper to the bare minimum without compromising on durability or integrity and support, thus making for an ultra lightweight boot. It's placed into a medial panel on the instep of the shoe. Stitched lace cover - stretchy Daewoo synthetic material to create a very clean striking area. Speed Last - re-engineered contoured last mirrors and supports the anatomical curves of your foot. Internal Chassis made from a dual compound of carbon fiber and glass-reinforced nylon to transfer energy directly to the cleats. Vapor Traction - two-piece TPU plate with direct inject bladed studs in the heel and Vapor forefoot plate with multi-directional traction pattern. An extra stud has been added to the ball area of the foot which is designed to help with deceleration and turning at speed.